A great startup involves a great idea, hard work and lot of passion towards work. In our series ‘Superhero of Startup’ we appreciate the effort a team does to make it’s company reach the heights. And Today Superhero of Startup badge goes to Mohit and his team for the tremendous efforts them to set up CVduniya. CVDuniya, is the brainchild of Mr Sagar Madgunki, who is currently working in South Korea. CVDuniya is a start-up aimed at helping students with aspects that are of utmost importance related to placement and MBA Admissions. CVDuniya provides review & editing services w.r.t. to Resume & CV, Cover letters, MBA Application forms, Essays, SOP, LOR, Aptitude & Interview Coaching, prominently among others. We also help people get their Resume Website or Resume Videos. Sagar had been helping many students & friends from the past couple of years for CV editing, aptitude coaching. Contemplation & research led to the fact that the free online templates/tips aren’t so unique & most of them are only system generated. Those offering paid services, the prices are on the higher side, which turns out to be expensive for the students. A platform to provide such services, with topmost quality seemed necessary. Realizing the need & the huge market CVDuniya decided to jump in. Within no time we had a team of some exceptionally good & experienced writers. With our exorbitantly low prices, CVDuniya mainly aims to help students achieve their dream jobs & colleges. As mentioned earlier, CVDuniya was started by Mr. Sagar Madgunki. 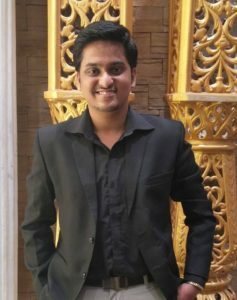 He completed his Instrumentation Engineering from VESIT, Mumbai in 2015. From the past one year, he has been working on behalf of a global Automation MNC for a project at South Korea. The core team is formed by Mr. Swapnil Landge, Mr. Arjun Nambiar & Mr. Yogesh Dhadve, all of them who hold an Engineering degree. Members of the core team, are also working at respectable positions globally but are committed to the vision & service at CVDuniya. The good rapport & trust among the team members coupled with their dedication & talent has led CVDuniya to achieve so much, within such a short time frame. There a few big names online & some offline ventures which deal with the business we are dealing with. At CVDuniya, everyone right from the founder & core team members, are subjected to Professional writing training. 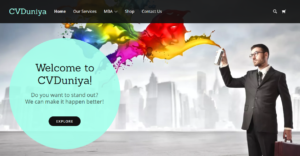 The services by CVDuniya are extremely affordable & are always ensured of high quality. We work with the client till they are satisfied. For MBA services, we get applicants in touch with students & alumnus of IIMs. We are trusted not just by the students, but also by a few start-ups who have readily collaborated with us for helping us provide better service. CVDuniya firmly believes that, our service, quality, pricing & efforts to reach out to the needy along with our collaborators give us a healthy edge over the competitors. Due to the huge market available, the revenue potential is too good in-spite of the affordable prices. Considering the amount that’s invested/that needs to be invested the margin is pretty good as well. We are just beginning, and as we mature the scenario would change, which will make it imperative for us to come up with different business plans. Survival at any point won’t be an issue for us. At any given time, our plans would always be based around affordability & quality. As we grow further, we aim to make it the biggest platform for Professional Writers & people seeking help with respect to Resume & MBA Applications. The feedback that we have received so far has been very positive & motivating for us. We aim to bring in more of Automation, which would enhance our quality of services. With investment & resources at hand, we aspire to get into other services such as GRE Applications to name a few. Currently, we aim to be the best in what we are offering & build a pan India presence. Further down the line we see CVDuniya being a one-stop solution for students especially.